Summer is finally here, and you know what that means: ROAD TRIP! Many of us are likely to embark upon a quick vaca in the car this summer, so we turned to an experienced traveler to share her 3 “Road Trip Must-Haves” with us today. Every Tuesday, we bring you short videos featuring some of your favorite bloggers and personalities, asking them about their “must-haves” for different life events. If you’re a mom, you know you’re going to be climbing all over the car grabbing something for someone throughout the trip. Plus, chances are you and your spouse don’t share the same internal thermostat, so it’s important to be covered up and comfortable. It’s usually up to mom to carry everything from cameras and chargers to snacks and supplies during a road trip, and to do that mama needs a big tote! Comfy shoes are a must, especially ones that are “easy on, easy off” for the frequent bathroom stops you know you’ll be making on the road. And if you’re in the market for a new pair of shoes, you’re in luck because The Great Shoe Sale is going on right now at Macys.com. You’ll save up to 40% off when you buy 3 or more pairs of shoes. So if you’re heading out on the road this summer, we hope these insights from a seasoned traveler will help with your travels. 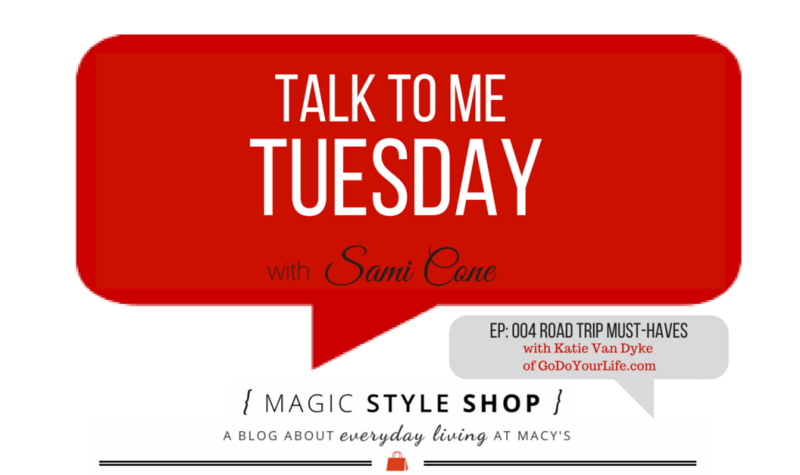 Come back next week for another episode of “Talk to Me Tuesday“!